Add to your Marvel Milestones statue collection! Captain America stands about 16-inches tall! Cap comes packaged in a full-color box with a certificate of authenticity. Limited edition of just 1,000 pieces. Add to your Marvel Milestones collection with the Marvel Milestones Civil War Movie Captain America Statue, the second release based on Captain America: Civil War. Standing approximately 16-inches tall, this amazing resin statue is limited to only 1,000 pieces. It comes packaged in a full-color box with a certificate of authenticity. 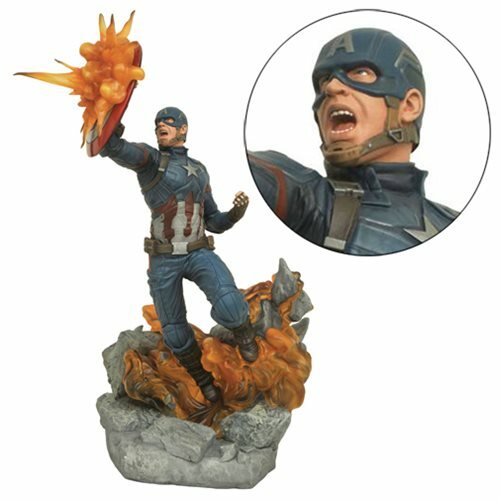 Raising his shield to deflect a blast of energy, Captain America can stand alone, or pair him with the Marvel Milestones Captain America: Civil War Iron Man Statue (sold separately) to form a larger scene. You decide to face them back-to-back for a team-up, or face-to-face for all-out civil war! Ages 13 and up.